After the experience, the couple decided to spread their knowledge — and healthy juices and tonics — in their community. 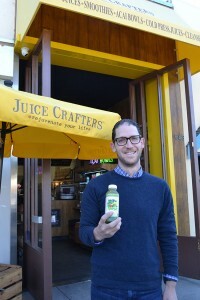 They opened their fifth location of Juice Crafters in San Diego County on Orange Avenue in November 2015, where they serve an array of cold-pressed juices, wellness shots, juice cleanse programs and acai bowls. Cold pressing with a specialized machine is regarded as the healthiest way to consume juice; the process maintains much higher levels of vitamins, minerals and phytonutrients that heat pasteurizing can strip away. “People are different than they were 20 or 50 years ago, when we weren’t aware of how eating can significantly affect our health,” said Goldwasser. 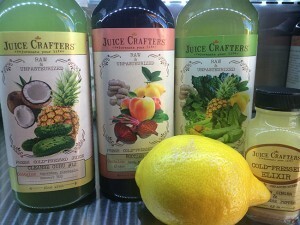 “We know now that sickness comes from what you put in your mouth.” Everything on the Juice Crafters menu is all-natural, vegan, with no sugar added. They also use mostly organic ingredients (all greens and all superfoods such as chia, spirulina and cacao are certified organic). And though many of Juice Crafters’ locally sourced farms cannot afford costly organic certifications, they do guarantee everything is pesticide-free and non-GMO. inflammatory properties. It’s also been shown to break down amyloid-beta plaques — hallmarks of Alzheimer’s disease. Wheatgrass is another popular item that boosts immunity, supports the liver and detoxifies the body, and according to Goldwasser, is recommended by physicians for patients undergoing chemotherapy. It’s very high in polypeptide proteins, which the body efficiently breaks down for use in the blood stream and tissues. It boasts the full spectrum of B vitamins and is packed with tons of vitamin A and C as well as calcium, phosphorus, magnesium and potassium. Juice Crafters also offers cleanse programs that can be done for any number of days; each day of a juice cleanse entails eight different juices. Roizen worked with a team of nutritionists to come up with the daily juice regimens to ensure participants still receive all the vitamins and nutrients the body needs.